Advancement in imaging techniques plays a vital role in further innovation in radiotherapy practice. The accuracy of target delineation has been improved by the use of magnetic resonance imaging, positron emission tomography-computed tomography (CT), and CT/four-dimensional CT whereas localization of tumor on the treatment delivery machine (i.e., accuracy of treatment delivery) has been improved using megavoltage portal imaging, kilovoltage (kV) planar imaging, cone-beam CT (CBCT), and stereoscopic imaging. A survey performed by Simpson et al. showed that use of image-guided radiotherapy (IGRT) technology is increasing and is expected to grow further. Full potential of advanced technology such as intensity-modulated radiation therapy (IMRT) can be exploited better if it is combined with IGRT. , The support of imaging system during treatment enables planning staff to reduce additional margin during target delineation. The use of imaging system in due course of treatment not only provides positional accuracy but also gives the opportunity to individualize the treatment for each patient. Adaptive radiotherapy has shown improvement in radiation treatment plan for head and neck region. Repeated imaging is considered as mandatory for individualized treatment to cope with anatomical changes that occur during treatment. ,, Schwarz et al. 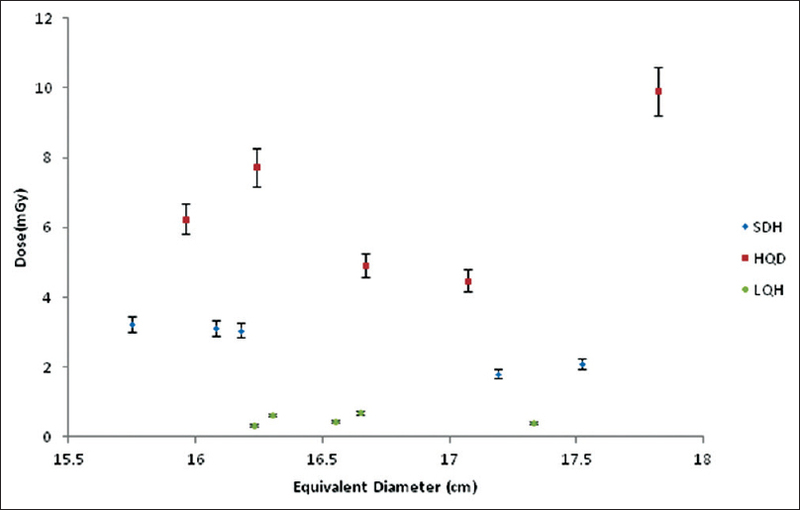 have reported on an average 30 CT sets in addition to the planning CT for adaptive radiotherapy; Court et al. have reported daily use of portal images for patient setup verification. A downside of the increased imaging is the additional dose burden to the patient during the radiotherapy that increases the risk for deterministic effects to organs at risk in and outside the primary treatment area; the risk for stochastic effects cannot be excluded even for small doses. CBCT acquisitions modes are designed to reduce dose to a minimum and are sufficient for soft tissue and bone contrast for daily setup corrections. However, the reduced dose may lead to limitations in the usability of the acquired image sets as the image quality and accuracy of CT numbers may decrease accordingly. To overcome this problem, IGRT systems have task-specific image acquisition protocol. If images are used for alteration of plan or review change in anatomy of patient, high-quality images are acquired with high imaging dose to patient; otherwise, for daily setup verification, low-dose images are acquired. On the basis of recent epidemiological studies on cataracts of the eye lens, the International Commission on Radiological Protection has recommended to set a new lower threshold dose (2000 mGy) for radiation-induced cataract. This step by the Commission compels to estimate the eye lens dose in different medical procedure and evolve a methodology to justify and optimize it. The purpose of this study was to directly measure eye lens dose to patients, using the indigenously developed optically stimulated luminescence (OSL)-based eye dose monitoring badge, subjected to different imaging protocols of Varian On-Board Imaging (OBI) system used for IGRT. The kV CBCT beam used in this study was Varian OBI (version 1.4) system integrated into a Clinac iX linear accelerator (Varian Medical Systems, Palo Alto, CA, USA). The X-ray tube with imaging system was equipped with a rotating W-Re target (G242). The tube potential can be set in the range of 40-125 kV. The isocenter of the CBCT is at 100 cm from the X-ray source, and the source-to-detector distance can be 140, 150, or 170 cm. The maximum X-ray field size at 100 cm is 50 cm × 50 cm. The OBI system has two working modes: full-fan beam mode and half-fan beam mode. In the full-fan beam mode, the detector is centered on the axis of rotation and is used to visualize regions with a small diameter or small soft-tissue organs, such as the prostate. The diameter of the field of view (FOV) is 25 cm. In the half-fan mode, the detector is shifted in a direction perpendicular to the kV X-ray beam, increasing the scanned area, hence enlarging the diameter of the FOV from 25 to 45 cm. In both cases, a filter is placed at the exit of the X-ray tube. The full-fan mode filter is symmetric with respect to the beam axis in the axial plane, being narrower at the center. The half-fan mode filter is asymmetric, narrow in the central part with increasing thickness toward the edge of the X-ray beam. These filters absorb part of the incident radiation and they are used to compensate for the difference in the thickness traversed by the beam on the patient so that the photon fluence that reaches the detector is as uniform as possible. In addition, the absorption of low energy X-rays reduces the dose received by the patient and the noise generated in the detector. 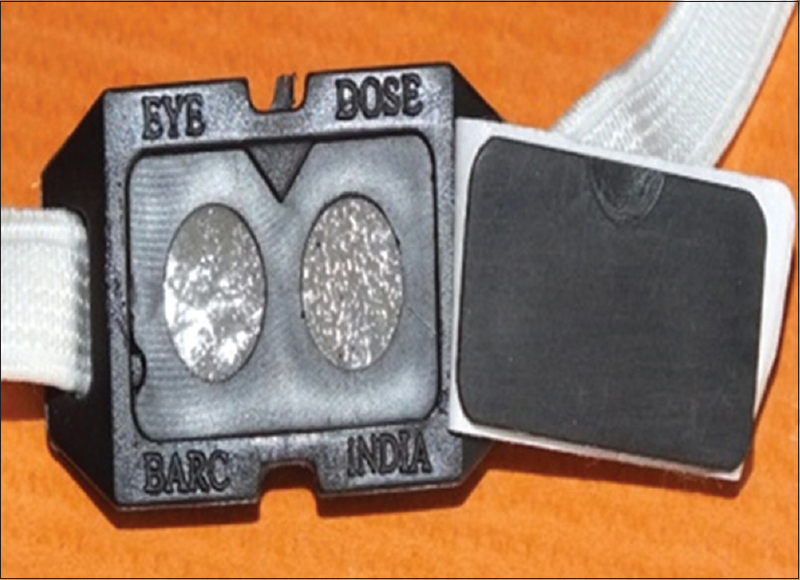 The α-Al 2 O 3 :C OSL-based eye lens dosimeter [Figure 1] used in this study is a BARC-designed eye lens dosimeter (Bhabha Atomic Research Centre, Mumbai, Maharashtra, India) which contains two discs loaded in a cassette having two filter regions, namely, (i) first region having 0.135 cm thick Teflon filter, and (ii) second region having 0.03 cm Cu and 0.08 cm Al filter on both sides of the dosimeter. The OSL badge has dimension of 2 cm × 1.5 cm × and 0.5 cm. The eye lens dosimeter is capable of measuring doses in the range of 0.10 mSv to 1 Sv. The α-Al 2 O 3 :C OSL discs used in the above dosimeter have a diameter of 0.7 cm and thickness of 0.014 cm and are prepared by sandwiching the α-Al 2 O 3 :C powder of grain size (75-100 μm) between two thin transparent plastic sheets. Three different CBCT acquisition protocols, namely, standard dose head (SDH), high-quality head (HQH), and low-dose head (LDH) protocols are available for head and neck region imaging in Varian OBI system. [Table 1] enlists the parameters for CBCT acquisitions protocols of Varian OBI system. As per these protocols, three groups of head and neck cancer patients were formed. Five patients per group were selected randomly in this study. These five patients in each of the groups cover a wide range of distance between isocenter and eye lens. Where APD is the largest anterior-posterior diameter and LD is the largest lateral diameter at isocenter slice of planning CT scan. The distance between the isocenter and eye lens dosimeter was recorded to assess the impact of position of isocenter on dose to eye lens. 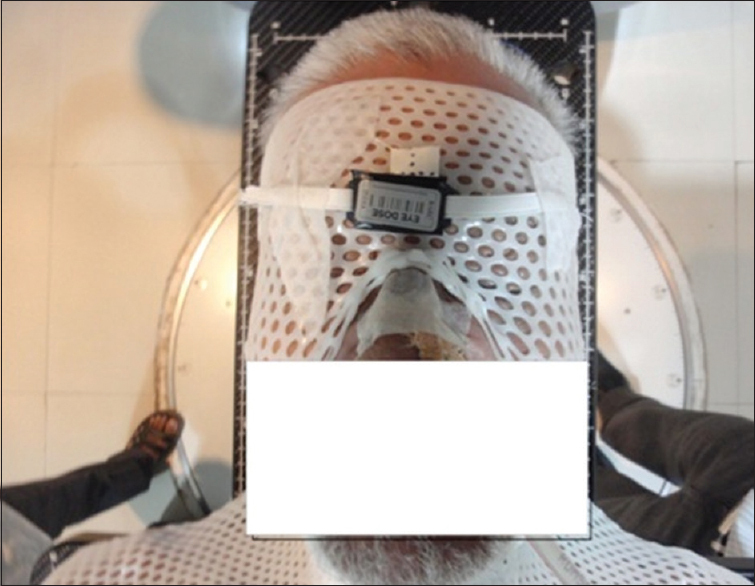 The eye lens dose measured for different imaging protocol of head and neck region is shown in [Figure 3]. 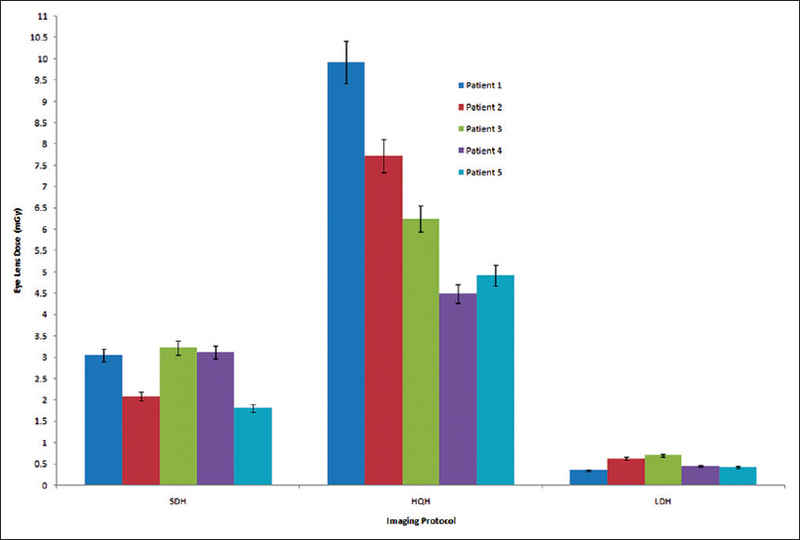 As shown in [Figure 3], dose to the eye lens varied significantly with acquisition protocol. The maximum dose was observed for HQH imaging protocol which ranges from 4.5 to 9.9 mGy and minimum for LDH imaging protocol which ranges from 0.3 to 0.7 mGy. For standard head dose imaging protocol, dose received by eye lens was in the range of 1.81-3.22 mGy. The impact of patient head geometry on eye lens dose is shown in [Figure 4]. Average EQD was 16.65 cm while minimum value was 15.75 cm and maximum value was 17.90 cm. As shown in [Figure 4], the eye lens dose for any particular protocol does not show any relation with the equivalent head diameter. 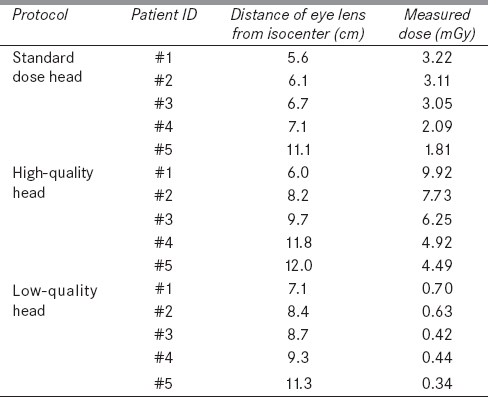 [Table 2] presents the eye lens dose as a function of distance between isocenter and eye lens. In general, for all the imaging protocols, eye dose mainly depends on distance between isocenter and eye lens, and eye lens dose is maximum when the distance between eye lens and isocenter is minimum. The lens of the eye is one of the most radiation-sensitive tissues in the body. High radiation dose to eye lens causes radiation-induced cataract. In radiotherapy, the patient is already exposed to leakage and scattered radiation dose coming out from the treatment equipment. The imaging dose will also contribute to patient dose. This study provides comprehensive information about eye lens doses from Varian CBCT head and neck protocols. Several researchers have reported the eye lens dose measured on anthropomorphic phantom , or using Monte-Carlo simulation. , Limitation of phantom-based dosimetry is its fixed geometry. In this study, the impact of patient geometry and distance of isocenter on eye lens dose has been reported. Ding et al. have reported eye lens dose <1 mGy for LDH protocol using Monte-Carlo simulation technique which is in agreement with our measured data which is found to be in the range of 0.3-0.7 mGy. For standard dose quality imaging protocol, Cheng et al. have reported eye lens dose about 3.5 mGy while we have measured the same in the range of 2.2-3.3 mGy. The large variation in the dose to lens among different protocols is because of mAs used for image acquisition. From [Table 1], it is clear that LDH acquisition uses only 72 mAs, SDH uses 145 mAs and HDH 720 mAs. Alvarado et al. have shown reduction of CBCT dose to half by changing mAs from 20 to 10. Frequency of CBCT image acquisition for head and neck region varies from institution to institution. As reported in literature,  for off-line protocol, CBCT should be done daily for first three consecutive days and thereafter once in a week. In this way, total 8-10 sets of CBCT images are acquired during the complete course of treatment. However, for on-line protocol, every day CBCT is required; there will be 30-35 acquisitions for the entire course of treatment. Eye lens dose will be nearly three times more in on-line correction protocol. Total dose to eye lens will depend on selection of acquisition protocol. Suitable safety measures such as blades can be used to shield the lens during image guidance which can effectively reduce the additional radiation dose delivered to both lenses from CBCT if the region of eyeball is not essential for field matching. It was observed that the more posterior the isocenter is located, lesser will be the absorbed dose to the optic structures. The measured data indicate that the eye lens dose depends on selection of imaging protocol and frequency of imaging. We also observed that the eye lens dose does not depend on patient geometry but strongly depends on distance between eye lens and the isocenter of the treatment field. However, undoubted advantages of imaging system should not be counterbalanced by inappropriate consideration of imaging protocol, especially for very intense imaging sequences for adaptive radiotherapy or IMRT. Daily image guidance should be used with great caution in certain cases, for example, where the treatment dose already reaches limits for organs at risk, particularly for the children. Results of this investigation are expected to guide the clinician and physicist to select the most suitable imaging protocol which will help in reducing the imaging dose to the radiosensitive organ of the patients. Simpson DR, Lawson JD, Nath SK, Rose BS, Mundt AJ, Mell LK. A survey of image - Guided radiation therapy used in the United State. Int J Radiat Oncol Biol Phys 2010;116:3953-60. Chung HT, Xia P, Chan LW, Park-Somers E, Roach M 3 rd . Does image-guided radiotherapy improve toxicity profile in whole pelvic-treated high-risk prostate cancer? Comparison between IG-IMRT and IMRT. Int J Radiat Oncol Biol Phys 2009;73:53-60. Castadot P, Lee JA, Geets X, Grégoire V. Adaptive radiotherapy of head and neck cancer. Semin Radiat Oncol 2010;20:84-93. Schwarz M, Giske K, Stoll A, Nill S, Huber PE, Debus J, et al. IGRT versus non-IGRT for postoperative head-and-neck IMRT patients: Dosimetric consequences arising from a PTV margin reduction. Radiat Oncol 2012;7:133. Court LE, Wolfsberger L, Allen AM, James S, Tishler RB. Clinical experience of the importance of daily portal imaging for head and neck IMRT treatments. J Appl Clin Med Phys 2008;9:2756. Spezi E, Downes P, Jarvis R, Radu E, Staffurth J. Patient-specific three-dimensional concomitant dose from cone beam computed tomography exposure in image-guided radiotherapy. Int J Radiat Oncol Biol Phys 2012;83:419-26. Richter A, Hu Q, Steglich D, Baier K, Wilbert J, Guckenberger M, et al. Investigation of the usability of conebeam CT data sets for dose calculation. Radiat Oncol 2008;3:42.
International Commission on Radiological Protection (ICRP). Statement on Tissue Reactions, ICRP Ref 4825-3093-1464; 2011. Kulkarni MS, Kumar M, Ratna P, Muthe KP, Biju K, Sunil C, et al. Design of prototype two element optically stimulated luminescence dosimeter badge for eye lens monitoring. Radiat Prot Environ 2014;37:106-10. Guide to the Riso TL/OSL Reader, RISO, DTU, Denmark; 2010. Kumar M, Kulkarni MS, Ratna P, Bhatnagar A, Gaikwad N, Muthe KP, et al. Studies on α-Al2O3: C based optically stimulated luminescence dosimeter badge for eye lens monitoring applications. Radiat Prot Environ 2014;37:89-93. American Association Physicist in Medicine (AAPM). Size Specific Dose Estimate in Paediatric and Adult CT Examination. AAPM Task Group Report 204; 2011. Islam MK, Purdie TG, Norrlinger BD, Alasti H, Moseley DJ, Sharpe MB, et al. Patient dose from kilovoltage cone beam computed tomography imaging in radiation therapy. Med Phys 2006;33:1573-82. Hyer DE, Serago CF, Kim S, Li JG, Hintenlang DE. An organ and effective dose study of XVI and OBI cone-beam CT systems. J Appl Clin Med Phys 2010;11:3183. Cheng HC, Wu VW, Liu ES, Kwong DL. 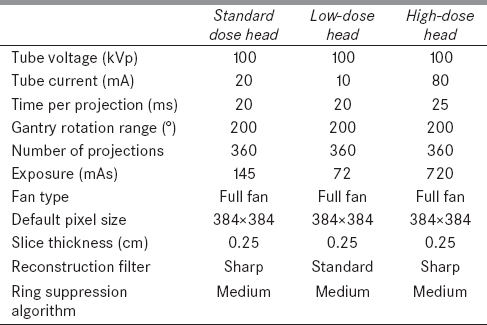 Evaluation of radiation dose and image quality for the Varian cone beam computed tomography system. Int J Radiat Oncol Biol Phys 2011;80:291-300. Ding GX, Munro P, Pawlowski J, Malcolm A, Coffey CW. Reducing radiation exposure to patients from kV-CBCT imaging. Radiother Oncol 2010;97:585-92. Ding GX, Duggan DM, Coffey CW. Accurate patient dosimetry of kilovoltage cone-beam CT in radiation therapy. Med Phys 2008;35:1135-44. Alvarado R, Booth JT, Bromley RM, Gustafsson HB. An investigation of image guidance dose for breast radiotherapy. J Appl Clin Med Phys 2013;14:4085. National Radiotherapy Implementation Group Report: Image Guided Radiotherapy Guidance for Implementation and Use. NHS Report; 2012.